Illipe butter is an exotic butter derived from the nuts of the Shorea stenoptera, a species of the Dipterocarpaceae plant family. The majestic illipe trees can grow to 15m in height and are native to Malaysia, typically found in Borneo. A phenomenon of many Dipterocarp forests is the remarkable feature of mass flowering, followed by mass fruiting. The nuts are around 5cm long and 3cm in diameter, they are enclosed in a thin, brittle case with wing-like attachments that help the nut fall clear of the mother tree. Nuts are collected from the forest floor and dried in the sun until the shells are brittle enough to be separated; the nuts are then pressed to extract the raw fat within. The nuts contain about 50% fat. This fat has been used for centuries by the native Dayaks to treat skin problems. The butter is creamy white with a mild odour. 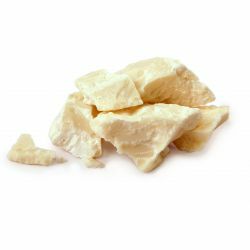 Illipe butter resembles cocoa butter, but has a higher melting point. We have used in illipe butter in our Oatifix fresh face mask for its softening quality. Illipe will moisturise the skin, restoring its flexibility, and some say this is the most nourishing of all the butters. We have used Illipe butter in our Vanilla Dee-Lite body lotion for its rich moisturising quality.